Here comes spritz cookies again! 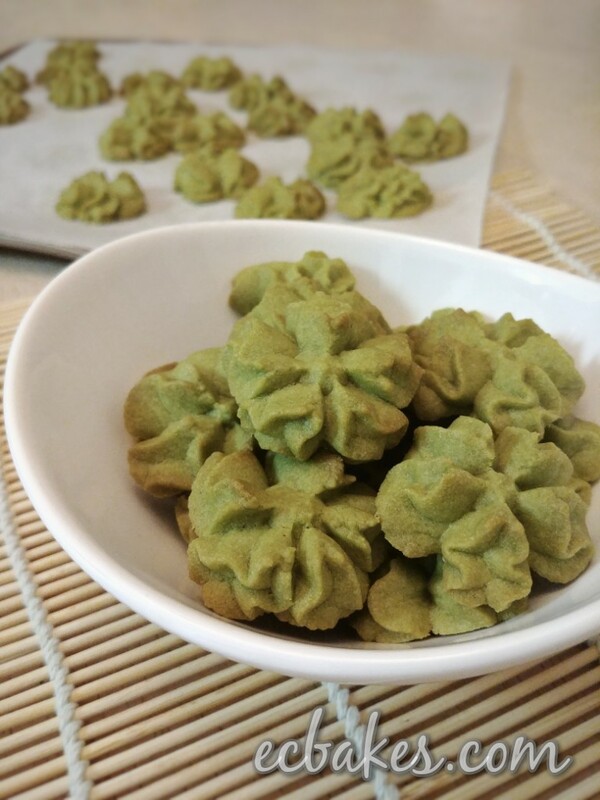 These cookies have same structure with Viennese Sablés but I flavoured them with matcha (green tea) powder. There is a subtle green tea flavor and the use of egg yolk makes the cookies extra crumbly. Even my kids who seldom eat green tea treat said the cookies were scrumptious. You may ask, “why use egg yolk this time? And how about the leftover egg white?”. Well, it is fine to use whole egg, but egg yolk will tenderize the cookies, creating a crumbly and sandy texture. In fact, i used whole egg in my Chocolate Espresso Spritz Cookie and egg white for my Viennese Sablés. They all have different textures so it’s all about personal preference. Leftover egg white can be used for other cookies such as Black Sesame Almond Thins, Fortune Cookies, French Macarons and Shiroi Koibito. Therefore there will definitely be no wastage. It is crucial to pay attention to the color change of the cookies during baking. Do not let the cookies brown too much as it will effect the beautiful, vivid green color (I will show you a picture of my overbaked cookies at the end of the post). Moreover, choose only Japanese matcha powder. It’s a bit pricey but, from my baking experience, Chinese and Taiwanese brands tend to be dull green in color and not as flavourful as Japanese stuffs. During my second adjustment of this recipe, I piped a thick, three tiered star shape. After baking for a full 20 minutes, I found that the cookies were still undercooked inside. I had to send them back into the oven for another 5 minutes. However, when the cookies were finally baked, the edges were too brown and the texture had become hard. Now I’ve learned a lesson not to pipe the cookie too thick. Preheat oven to 325℉/160℃. Line baking sheet with parchment paper. In the bowl of a stand mixer fitted with the paddle attachment or with an electric mixer, beat butter on low speed until smooth (the butter must be very, very, very soft). Add icing sugar then beat on low speed until smooth and creamy. There is no need to beat air into the dough so do not beat mixture to the light and fluffy stage. Too much air will cause the cookie to spread in the oven. Add egg yolk and beat until fully Incorporated. Scrape down the side of the bowl with a spatula. Sift flour and matcha powder in another bowl. Fold in the flour mixture in two batches with a spatula. Stop mixing once a soft dough is formed. Do not over-mix. Transfer batter into a piping bag fitted with a large pastry tip (I used a 1F large sized sakura tip). Eliminate all trapped air bubbles then pipe batter onto the baking sheet. I only piped a dollop of batter for bite-sized cookies. This portion will make about 50 to 55 cookies. Bake for 10 to 12 minutes, watching carefully during the last couple of minutes as you don’t want the cookies to brown. Cool completely on a cooling rack. Cookies can be stored in an airtight container at room temperature for 2 weeks. For longer storage, keep in freezer for up to 2 months. Without thawing, bake at 300℉/150℃ for 5 to 8 minutes then cool completely before serving. I used this 1F large size sakura tip. Do not overbake the cookies like I did last time! Matcha cookie is my favorite. I will try this recipe . I wonder if I can use a handy egg mixer instead of an electric one for beating butter, sugar n egg yolk. Btw, I wonder if I can put more green tea powder to the dough if I want to have A strong flavor of green tea. Hi Venus, thanks for stopping by. Yes this cookie can be prepared by hand (with a whisk) or by electric mixer. Feel free to increase the amount the matcha powder according to taste. You may wannna increase the sugar amount to balance the bitterness though.